The Lunch with Western Scholars symposium series returns! 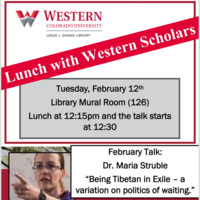 In February, Dr. Maria Struble will speak on "Being Tibetan in Exile - a variation on politics of waiting". Come to the library Mural Room (1st floor) at 12:15pm for a free lunch, followed by the talk at 12:30pm. Leslie J Savage Library, 126 "Mural Room"